The Self-Absorbing Man: Happy Memorial Day! I've had a Photoshop epiphany. I am very happy right now because I've finally figured out what I've been doing wrong for the last seven years (at least when it comes to press-ready files). I'll explain when I get some free time... and after I see the printed results in about a month. 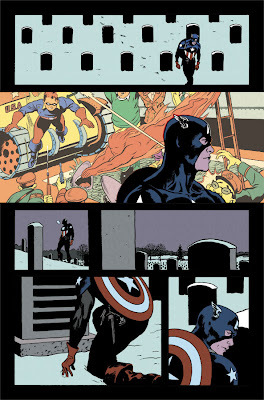 In the meantime, there's a preview of Young Allies at marvel.com. The color images aren't the finals, but they're close enough. Its always great viewing your work at different stages. I'm glad you update as often as you do. I am looking forward to Young Allies! ...yeah man...i cant wait for this to come out. I love seeing your process. Keep'em coming! Thanks! I just finished last night, so I'll be posting some of the final artwork in the coming weeks.